Hosts from New Zealand Nuka Conference gift SCF leadership in honor of their leadership and presentations. Health care organizations from several regions in New Zealand have worked closely with Southcentral Foundation for more than 15 years. Similarities in health disparities in Maori and Alaska Native communities, and a shared desire to redesign health care, are the foundations for the ongoing partnership. Large delegations have participated in Southcentral Foundation’s Nuka System of Care Conference and site visits over the years. Southcentral Foundation President/CEO Katherine Gottlieb served as an expert witness in the first stage of a series of hearings that aim to shift ownership of Maori health services to Maori people. The WAI 2575 Health Services and Waitangi Tribunal hearing parallels the journey Alaska Native people took to own and operate health services through self-determination. 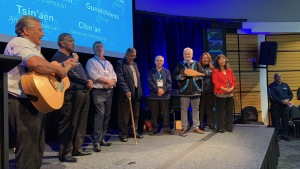 Ngati Kahungunu Iwi Inc., a Maori Tribe in the Hawke’s Bay region and Hawke’s Bay District Health Board, the regional government public health service, collaborated to host a two-day Nuka Conference for 350 members of their leadership and health care providers. Gottlieb provided a keynote address and co-led workshops with members of SFC’s Board of Directors, Dr. Terry Simpson and Charles Akers. Other sessions covered topics such as SCF’s integrated primary care teams, behavioral health services, quality improvement, and workforce development. Gottlieb, SCF Vice President of Medical Services Dr. Doug Eby, and SCF Senior Director Leanndra Ross presented on a panel hosted by Te Taiwhenua O Heretaunga, a local Maori Tribal authority, sharing about SCF’s transformation journey. The SCF delegation also led a one-day workshop on communications tools, techniques, and sharing story for leaders from Te Kohao Health, a Maori health provider in Kirikiriroa (Hamilton). It was an abbreviated version of SCF’s three-day Core Concepts, a workshop that all SCF employees attend, which teaches skills and tools for building and maintaining effective relationships. Gottlieb provided a keynote on her leadership journey at the Moana Pacific Women’s Network, hosted by Pasifika Medical Association, in Auckland. Pasifika Medical Association is a network of more than 2,000 Pacific health professionals. Gottlieb and Ross led a workshop on sharing and responding to story, which is also a part of SCF’s Core Concepts, with leaders and health care providers from Pasifika Medical Association and Pasifika Futures. Pasifika Futures is a non-governmental organization that works with regionally-based health care providers and partners to improve health services to whanau (families). For more information about SCF’s Nuka System of Care, visit SCFNuka.com.